There is a backwoodsy, subalpine, state park with multiple granite crags, some of which may never have been climbed, ranging from 50 to 450 feet in height. A park fee is required to park. The rock is mostly granite ranging from 8000-10000 foot altitude. Beautiful vistas soothe your eyes from belay perches. People have been climbing here since at least the 1950s. There are mostly traditional climbs; however, sport-ish climbs are appearing here more recently. Some approaches exceed an hour. Rocks here include: Mount Thorodin's 1st, 2nd, & 3rd buttresses; Ralston Roost; Son of Ralston; Raven Knob, Odin's Good Eye, Odin's Rib Cage, Tremont Mountain, The Bear, The Cub, The Rainbow Bridge, Odin's Throne, rocks near the campgrounds, a bizarre spire named Lazy Squaw Spire, Dude's Throne, Little Dude's Throne, and The Grendel. There are other intriguing looking crags visible from the road to Panorama Point. Some fixed gear is quite suspect (I pulled an angle out with only light finger pressure). From CO Hwy 93 just North of Golden, follow the Golden Gate Canyon road perhaps 18 miles to Golden Gate Canyon State Park. There are multiple crags in the area. The biggest are off Mt. Thorodin, accessed & visible from Panorama Point, up the windy road past Kriley Pond. Lazy Squaw Spire can be accessed from the Lazy Squaw Ranch near Panorama Point. Son of Ralston & Ralston Roost can be accessed from Golden Gate Canyon Road. An alternative routes in which feel very nice include: via White Ranch Park & Golden on Crawford Gulch Rd; via CO 199 and Gilpin Rd/Gap Rd; and via CO 119 to Hwy 46; via Coal Creek Canyon (CO 72), Twin Spruce (near the Bus Sandwich Shop), then Gap Rd. There is camping here both backcountry and at established campgrounds. The backcountry campsites include: Forgotten Valley, Deer Creek, Frazer Meadow, Rim Meadow, and Greenfield Meadow. These campgrounds include Rifleman Phillips Group Campground (reservations only), Reverend's Ridge Campground (limited winter facilities), and Aspen Meadows Campground (closed in winter). There are also accomodations at Harmsen Ranch Guest House by reservation. Maximum camping stay in the park is 14 days within any 45-day period. Golden Gate Canyon SP website. Note, there is hunting permitted on the northeastern corner of the park after Labor Day to prior to Memorial Day. There is also hunting in the Ralston Creek State Wildlife Area to the southeast of the park. Pets must be kept under control and on a leash. Please note that there are regulations on bolting within the state park that require permits for any new bolts. Crystal Dreiling, senior ranger for GGCSP, will advise us on additional information. Please try to avoid erosional problems with approaches to climbs and social trails. "Jugs Out For The Lads", an enjoyable romp. Along the ridge of Mt. Thorodin. Mount T. from RR campground! A curious chunk of rock below Lazy Squaw Spire. 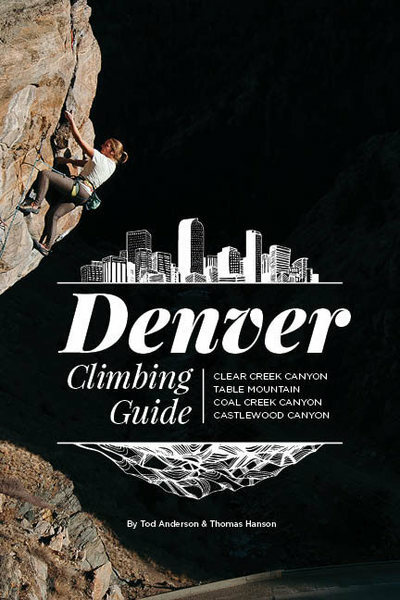 Sharp End Publishing has recently released a new Denver Climbing Guide that includes comprehensive coverage of Clear Creek Canyon, North Table Mountain, Coal Creek Canyon (the legal climbs) and Castlewood Canyon. It has many more routes than even the latest Clear Creek book. In addition to the concise format, we've incorporated GPS coordinates in the form of scannable QR codes that opens the location in Google maps on your smartphone.